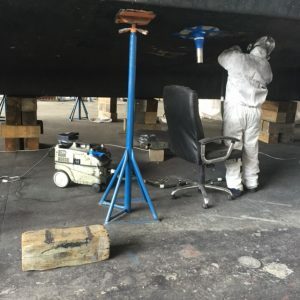 Every system on a mega yacht is important to the overall comfort and safety of the vessel and vessel’s using hydraulics are no exception. So how often should a hydraulic system, like those used for the steering, stabilizers, bow thrusters or windlass operations be flushed? 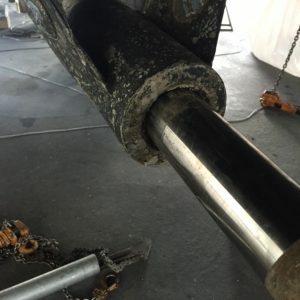 To be on the safe side, a sample of the hydraulic fluids should be tested every six to 12 months or whenever the system is opened and potentially exposed to outside contaminants, you suspect that water may have infiltrated the tank or metal particles are found in the oil. There are three methods for flushing a hydraulic system. The first is a simple drain, filter, fill approach referred to in our shop as a DFF. This type of flush is actual more of an “oil change” and is typically recommended for routine maintenance. It is not appropriate where a more serious condition such as water, metal particles or other contaminants are found in the oil. In this scenario, we would drain the hydraulic tank, change out the filters and refill the tank with hydraulic fluid. Pretty straight forward. 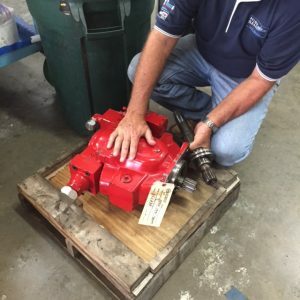 The second method, known as a double oil and filter change, requires us to drain the hydraulic tank and fill with fresh oil that will be circulated using on-board system pumps. 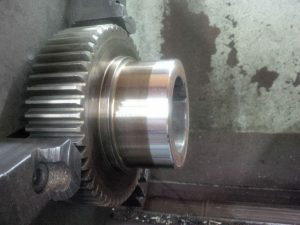 This method would be suggested under a few conditions; many years since last oil change, requirement to change oil types, minor discoloration of oil, etc. This method involves an initial oil drain from the tank and low points in the system and filter change which can expel a large percentage of contaminants and degraded fluid. We would then fill the tank to the minimum level allowable to still safely work and circulate the oil until operating temperature is achieved. The oil is drained again and the filters changed for a second time before re-filling the hydraulic tank with fluid. For best results, the system should be drained as thoroughly as possible including the tank and manually cleaned. The last option is more time consuming and costly and is used when there is known contamination of water or metal particles. 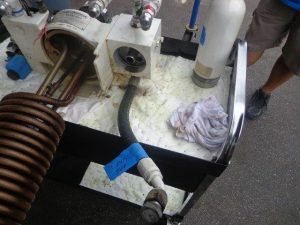 This method often uses special high pressure pumps or power flushing rigs. Some of these pumps or rigs have directional valves that enable flushing direction to be changed which can assist in dislodging contaminants from dead spaces throughout the system. 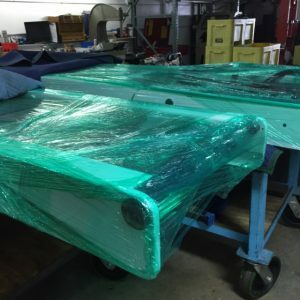 As in previous methods, the first step is to drain all old hydraulic fluid from the system and refill with a low viscosity fluid that will be circulated at high velocities to create turbulent flow conditions that equate to a Reynolds number of more than 2,000. This process would be repeated as needed until there is no longer any contaminants present in the filters or fluid. We would also remove, inspect and when necessary replace any hoses, cylinders and valves that are damaged. 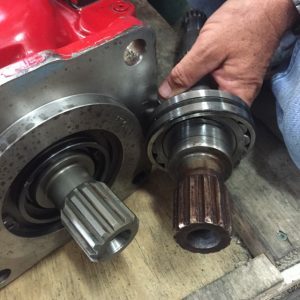 Just like changing the oil in your car or any other mechanical device, hydraulic systems on your yacht need care and attention to keep them performing in peak conditions for years to come. 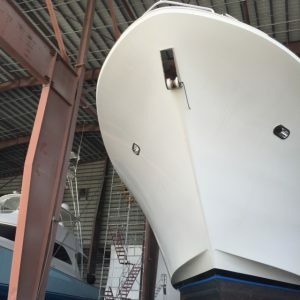 We were recently contracted to inspect a leaking heat exchanger on a 130 foot Westport yacht docked at a local marina. The heat exchanger was part of the hydraulic power unit (HPU) for the ship’s bow thruster system. The HPU consists mainly of a motor, a reservoir tank and a hydraulic pump. These units can generate a tremendous amount of power to drive most any kind of hydraulic ram or motor. They can also generate high temperatures. Most heat exchangers used in the marine industry are water cooled and use a water control valve to regulate the flow of water though the exchanger to keep the hydraulic fluid temperature between 64 and 68 degrees C (147 and 155 degrees F). It is important to make sure the adjustments for the water control valve are set properly to avoid rapid overheating. This particular model was a shell and tube design. 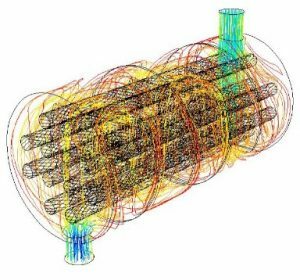 As its name implies, this type of heat exchanger consists of a shell (a large pressure vessel) with a bundle of tubes inside it. One fluid runs through the tubes, in this case hydraulic oil, and another fluid, water, flows over the tubes (through the shell) to transfer heat between the two fluids. The set of tubes is called a tube bundle and may be composed of several types of tubes. Upon inspection, we found that the fittings in the heat exchanger were not properly seated and the sealant used was not sufficient for the job. In order to remedy the problem, we needed to remove the heat exchanger from the HPU and send it out for servicing. 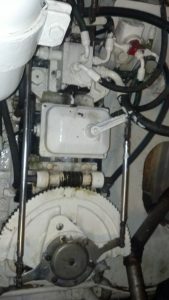 In order to do this, we had to disconnect the hard pipe Stauff clamps above the heat exchanger in order to spread the pipes apart to remove the heat exchanger from the bilge. We also disconnected and installed caps and plugs in the hoses connected to the heat exchanger. 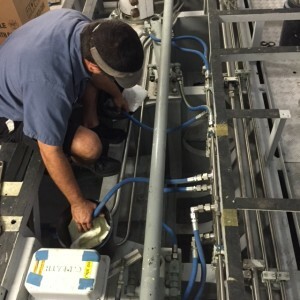 We resealed the adapters and fitting upon re-installation, connected the hydraulic hoses, installed Stauff clamp supports and tested the unit for leaks. 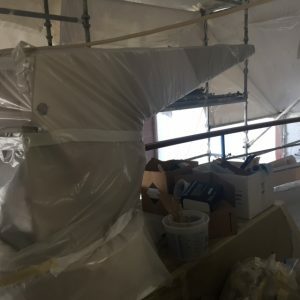 The heat exchanger is back in operation and helping to ensure that the hydraulic bow thrusters are doing their job helping to maneuver this yacht in tight places.